While there are many factors that go into choosing a startup name, I believe one of the best pieces of advice offered is to keep the name short and easy to pronounce. Obviously, there are many exceptions to this rule, but I always felt that many of the better startups tend to have simple names. I decided to run a short analysis and check the correlation between a startup’s name and its chances of success. The conclusion: for startups, shorter names spell more cash. Unicorns tend to have shorter names. Box, Snap, Uber, Lyft, Domo, Houzz and Slack are apt examples. 107 U.S.-based unicorns—startups valued at $1 billion or more—tend to have shorter names compared to around a thousand U.S.-based startups that held Series A or B funding rounds this year. 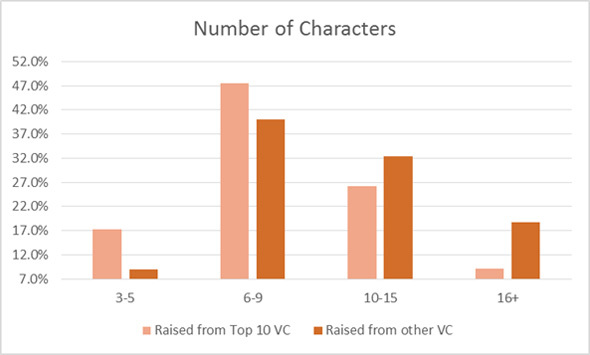 The median unicorn name is eight characters long while the median startup name is ten characters long. Even more important than having fewer characters in a name, is having fewer syllables. If there is truly a correlation between a simple name and the likelihood of success, it should be explained by the benefits of having an easier to pronounce and likely more memorable name. But there might be something else at work here. I think there exists some self-selection too: I postulate that founders who pick short names tend to be more confident than those who choose longer ones. They are less worried about being able to buy domains for cheap, or about having a name that explains precisely what the product does, or many other factors that often lead to longer names. If this hypothesis is true, startups with simpler, shorter names are more likely to succeed regardless of their name. To test this theory I decided to look at the quality of early investors as a proxy for the likelihood of success. The charts below compare the names of the 100 most recent U.S.-based startups that raised money from a top 10 venture capital firms according to CBInsights’ VC power rankings with startups that raised from other investors. Shorter names correlate with more money raised from higher-ranked venture capital firms. The number of syllables in a name correlates even more significantly with attracting top tier venture capital firms. Almost 50% of startups that raised capital from a top 10 venture capital firm had a monosyllabic name, versus 30.2% in other startups. Conversely, companies with long and complex names—more than five syllables—were much less likely to raise capital from a top 10 fund. There seems to be a relatively good correlation between simple, easy to pronounce name and the likelihood of success. You might just want to take that into account when naming your startup. Amit Karp is a partner at the Israeli office of venture capital firm Bessemer Venture Partners, headquartered at Menlo-Park, California.